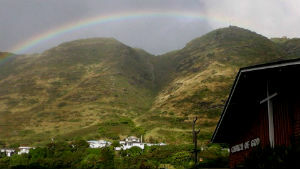 Photo: A rainbow reminds the Aina Haina Church of God that God keeps his promises. As the crow flies, 4,358 miles separate Anderson, Indiana, and Honolulu, Hawaii. Activities and events that bring the Church of God together, such as the Church of God Convention, aren’t just a three-hour drive, or even a four-hour flight. While the Church of God in the continental United States enjoys multiple fellowship opportunities throughout the year, the Church of God in Hawaii often feels disconnected. Through the years, Aina Haina Church of God has faced great ministry difficulties and outreach challenges in isolation. Things are about to change. The Holy Spirit’s work was evident in the planning of a meeting in late 2014 with the Aina Haina congregation, former Aina Haina pastor Bob Christensen, Handel Smith from Church of God Ministries, and Steve Robertson, who serves as the regional pastor of the Church of God Association of Northern California, Northern Nevada, Hawaii, and Guam. Bob, Handel, and Steve each felt the leading of the Spirit to spend significant resources and time to make the trip to the Aloha State—and not for a tropical vacation. In fact, when you’re assignment is ministry in Hawaii, it won’t be a picnic. Bob, Handel, and Steve knew it was time to re-establish a life-giving connection with the Church of God in Hawaii. But they had to rebuild some trust. “Initially, it was perceived by the congregation that Church of God Ministries had taken entirely too long to connect,” Handel reflects. “We had to rebuild trust. But then the subject of our conversation became Jesus. We spoke about Jesus. We asked for forgiveness. We asked for an opportunity to partner in helping the church to reach their local community for Christ.” Though the past wasn’t pleasant, and though hell had won some battles, a new day was dawning late last year for the Church of God in Hawaii. “We took a stand for Jesus, and reclaimed that which the enemy had stolen,” Handel recounts. On Sunday, what God had accomplished in just a few days culminated in a powerful worship service. “There was excitement, there were tears, and the presence of God was truly in that place,” Handel recalls. For the “True Story of Ministry in Paradise,” read this CHOGnews article from May 2013. Learn more about the Church of God at www.JesusIsTheSubject.org. This entry was posted in All Church of God, Western and tagged Aina Haina, Billy Pearson, Bob and Barbara Christensen, Califiornia, Handel Smith, Hawaii, Honolulu, Steve Robertson. Bookmark the permalink.